Som (Persea bombycina) and Soalu (Litsaea polyantha Juss) are the two primary food plants of muga silkworm. Both the plants can be propagated through seeds. 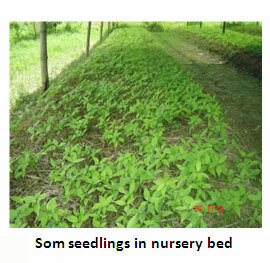 Seeds of selected healthy plants ensure production of healthy seedlings. Select well drained high land in a shady place. Plough the land up to 30 cm depth and level properly. Make 15 cm elevated beds of 5m x 1.5m. Maintain 30 cm gap between two beds. Apply 50 kg FYM and 200 g Malathion dust and mix it thoroughly with the soil. Collect mature seeds from the plants during May/ June. De- pulp the seeds in running water. Check the seed viability by floating test in water. Select the seeds which settle at the bottom of water. Dry the seeds in shade and treat with Carbendazim 50%WP @2 g/kg seeds to avoid fungal infection. It is desirable to sow the seeds soon after collection. Healthy seeds above 0.3 g in weight and 7 mm in diameter are ideal for sowing. Soak the seeds for 24 hours in water prior to sowing. Cover the seed beds with a thin layer of hay or thatch grass. Wet the bed thoroughly by sprinkling water and repeat watering at regular interval. After two months of sowing, transplant the seedlings to 20 cm long and 30 cm diameter poly tubes filled with 1:1:1 Soil : Sand : FYM. Irrigate once in a week. 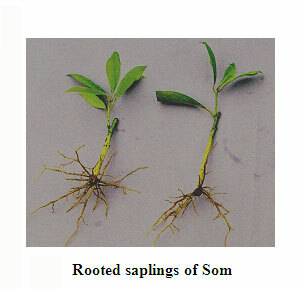 6 months old juvenile branches of 10 – 12 cm length with a single leaf and a viable axillary bud are treated with 300 ppm IBA by quick dip method and planted in moist sand bed. It ensures 72.0 – 88.0% rooting and 70.0 – 86% survival. Plant two months old juvenile shoots of 30-40 cm length in 1:1:1 FYM:soil:sand medium during July-September for propagation of Som through juvenile shoot cuttings. Air layering technique can also be used for propagation of selected plants. Select well drained upland for plantation site. Plant during May to June. Plough the plot up to a depth of 30 cm. Make 30cm x 30cm x 30cm pits at a spacing of 3m x 3m. Fill the pit with 5 kg well decomposed FYM. Transplant 9 to 10 months old seedlings into the pits preferably on a rainy day. Periodical weeding: manually or by using power tiller. Apply FYM @ 5 kg/plant/year up to 4th year and 10 kg from 4th year onwards by making 15-20 cm deep ring around the plant during October-November. Apply N:P:K @ 40:70:15 g/plant up to 4th year and 80:140:30 g/plant from 4th year onwards by making 15-20 cm deep ring around the plant during April- May and September- October. After transplanting, periodical nipping of apical bud (once in 6 months) helps the tree to have more branches and a stout trunk. Practice periodical pollarding/ heavy pruning (step up/ step down) after rearing to maintain the canopy at 10-12 feet for effective management of rearing. 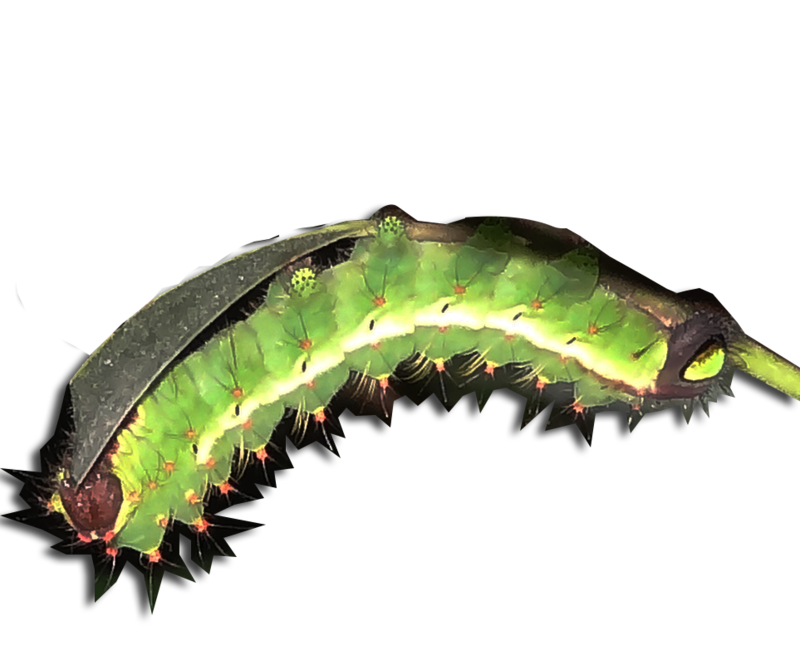 The stem borer caterpillar (Zeuzera indica) feeds the tissue of the trunk and make bores into the main trunk. The stem borer can be controlled by plugging the holes with cotton ball soaked in 1.5% Nuvan solution followed by mud plastering. Cricula (Cricula trifenestra), locally known as ‘Amphutukani’ voraciously feeds on leaves causing loss of foliage. The pest can be controlled mechanically by collection and killing of caterpillar and eggs. Cocoons should be collected and burnt to stop further multiplication. Spraying of 0.05% Phosphomidon can effectively control the pest. The Leaf spot (Phyllosticta perseae) is a fungal disease which can be controlled by spraying 1% Indofil M-45 twice at 15 days interval before the peak season of incidence. Leaf blight (Colletotrichum gloeosporioides) is another fungal disease. Plucking and burning of infected leaves at the initial stage can minimize the pathogen. Timely pruning and utilization of the leaves can prevent the disease. Indofil M-45 can be used as a general protective measure to control the leaf blight disease. Package of practices of Muga, Eri and Mulberry Sericulture for North Eastern region of India, 2005, Central Muga Eri Research & Training Institute, Lahdoigarh, Jorhat, Assam. Directory of Sericulture Technology 2008, Karnataka State Sericulture Research and Development Institute, Bangalore- 560 062. Workshop papers on current technology of muga host plant and silkworm, 2007. Central Muga Eri Research & Training Institute, Lahdoigarh, Jorhat, Assam. Sri P.K. Handique, Central Muga Eri Research & Training Institute, Lahdoigarh, Jorhat, Assam.